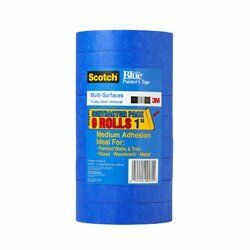 Scotch Blue Multi Surface Masking Tape, the original blue tape, clean removal time up to 14 days, interior or exterior use, medium adhesion level, for use on painted walls and trim, woodwork, glass, and metal. 60 Yard roll, 9 rolls per pack. Features: For most painted surfaces such as: painted walls, painted or finished trim and woodwork; glass and metal. Adhesion Level: medium. Removal time is up to 14 days. Coating being applied: water-based, solvent based; not compatible with lacquer coatings or surfaces. For interior or exterior.